Australian police are looking for the nail gun specialist accused of killing off a Chinese man who was shot 34 times in the head and neck with a nail gun before being dumped in a river. 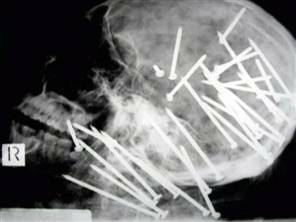 The 34 nails were found during a post-mortem examination of Liu’s body, and were located mainly in his skull. They were fired from an 85 mm nail gun at close range, Lonny the Detective said. Police have not recovered the weapon. So far detectives have come to this conclusion: “We certainly believe the nail gun is responsible for the death — there’s no doubt about that,” detectives said.